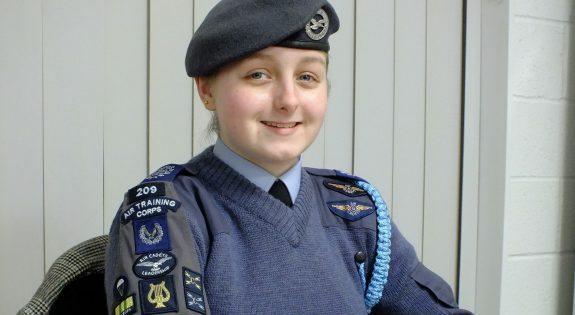 Cadet Warrant Officer Rebekah Oldknow, aged 19, is part of 209 (West Bridgford) Squadron and has gained every badge in every area of the diverse Air Cadet syllabus. During her cadet career Rebekah has gained qualifications in subjects and activities including Music (playing in the Region’s Concert and Marching bands), parachuting, leadership, target shooting and First Aid. She has been awarded her gliding and flying wings under the Air Cadet Aviation Training Package and has also become a Qualified Aerospace Instructor. She has also taken part in the Nijmegen Three-Day Marches in the Netherlands and has completed a Cyber Course at the RAF No 1 Radio School. As Cadet Warrant Officer Rebekah is the highest rank a cadet can reach and with this comes more responsibility within her squadron, including mentoring and helping deliver the training package for younger cadets. “We are all extremely proud of Rebekah and she is a great asset to us."